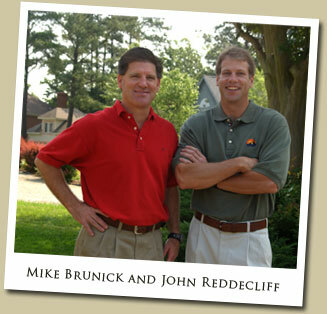 Definitive Homes is comprised of a partnership between Mike Brunick and John Reddecliff. Focusing on both production and custom homes throughout the Tidewater / Hampton Roads area, the company has developed a large portfolio of homes in a wide range of sizes and styles. Taking advantage of a long history of field construction experience, Mike Brunick focuses on the construction of each home. He works closely with a dedicated team of craftsmen and tradesmen who share our commitment to quality. As your home takes shape, Mike and our staff will be available on site to work with you on specific construction issues throughout the process. John Reddecliff brings a wealth of knowledge to the partnership developed from a 16 year career in banking. His focus includes product design, customer relations and financial issues, ensuring you a smooth and stress-free homebuilding experience. The unique partnership of Mike and John provides a foundation to Definitive Homes that separates them from other builders in the market. Every decision at Definitive Homes is made as though we were the ultimate owner of each home we build. This premise produces a company the aims to ensure enduring value for each of our clients. We consider it a privilege to live in the Tidewater area bordered by the Chesapeake Bay and the Atlantic Ocean. Definitive Homes was one of the first local builders to be certified as an EarthCraft Homebuilder in Virginia. EarthCraft House is a program owned by the Greater Atlanta Home Builders Association and Southface Energy Institute that has been introduced in Virginia through the Virginia Sustainable Building Network and the Blue Ridge Home Builders Association. As a green building program that provides the blueprint for healthy, comfortable homes that reduce energy bills and protect the environment, EarthCraft homes will save at least 30% in heating and cooling costs over a conventionally constructed home. Click here to find out more about the EarthCraft House. The home is built with the environment in mind. A third party “Green Building” agency certifies these homes. The home is the epitome of energy efficiency including a written energy efficiency warranty which guarantees a significant savings on energy costs when compared to conventional construction. The home is built with a wall system that is built to withstand Hurricanes, Tornados and Fire. The home is structurally resistant to water, insects and termites. There are even energy efficient mortgage programs, which take in to consideration the savings generated from these houses in the loan qualification process.